Listen to Handel's "Music for the Royal Fireworks"
Handel's music was played in pleasure gardens in the 1700s. Click on "Buildings" or "Transport", make your picture then click on "Finished" to go to the next picture. Choose an item and create your design. Click on the topics in the top menu. Click on a pdf link at the top right. This fabulous picture book shows a busy city through time, from the 1920s to the Stone Age. 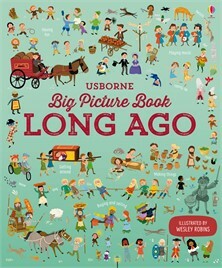 Illustrated by Wesley Robins, the colourful scenes are packed with information and details to spot, showing all sorts of people from different ages doing all sorts of things – servants, sailors, lords and ladies, Vikings, Romans and even a captured pirate.